Republican Senator (1979-present) representing Virginia for his third term. Law degree from the University of Virginia. Former Secretary of the Navy. 1989 Minute Man of the Year (Reserve Officers Association). Picture of Senator Warner taken at visit by the Charlottesville/Albemarle League of Women Voters to Washington, D.C. on June 2, 1989. "(I)n the afterglow of victory, (John) Warner last week said that he was set up during negotiations with the (Virginia NAACP) ... that the group backtracked at the last moment on an agreement that he would be introduced on camera by the president of Hampton University, a traditionally black college. He said that reversal prompted (Lyn) William's outburst, and the resulting flap" (Virginia Notebook, Washington Post, November 14, 1996). 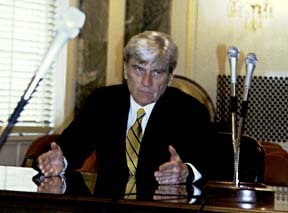 Lyn Williams had been fired by John Warner after he had acknowledged using a racial epithet in pre-debate negotiations. In Charlottesville ( Unofficial results, Daily Progress, November 6, 1996) SENATE: Mark Warner (D) 7,424; John Warner (R) 5,255.